Pilsen during the Protectorate. It's time to get rid of certain illusions about our heroism. Škoda Works, a Pilsen's factory, was one of the largest armories of Hitler's Third Reich. Its employees enjoyed material benefits and the actual life of the wartime Pilsen isn't overlapping with our visions about the dark years during the war. "It's time to say even things that aren't too pleasant for us," the publicist Zdeněk Roučka argues. His new book titled "Labor Is Honor" brings us a testimony about the Protectorate times in Pilsen. The first photograph is from Škoda Works where they are just producing Hetzer, a tank destroyer. He is the author of a new book that provides us with a multi-layered image of the Protectorate times not only in Pilsen, building on 780 unique photographs. What is the picture of Pilsen that your book presents? Was it a city where people lived relatively comfortably, in comparison with the Protectorate? Maybe in the first stage of the war. My aim was to show that the war proceeded differently than elsewhere – Škoda Works was one of the largest armories in the Reich. On the Protectorate territory, it wasn't the only armory, however. We had about 300 of them, not counting the smallest production units. I wanted to write an antipode to the books about the heroes of the Heydrichiad, the terror that followed the assassination of Reinhard Heydrich, I wanted to show the normal life. In that way, your respect for the heroes increases further. Because they put their lives at risk, instead of choosing life with benefits represented by the work in the armories? Exactly. Lots of witnesses have told me that those people who didn't express themselves, who looked for their personal issues, were ignored or approvingly tolerated by the Germans. Pilsen is a textbook example of that – it had a factory at the top, Škodamen were nifty men, and the Nazis needed them. Under the German organization, the local production reached giant levels. Levels so huge that lots of people still fail to get the point today. And because they were needed, the workers enjoyed holidays, dancing parties, healthcare, and extra rations? The book is about those things that people weren't willing to admit after the war – one of the reasons was that the hunt on the collaborationists was already underway. Czechs began to pretend that nothing like that had taken place at all. And after the 1948 communist coup, these debates – the badly needed verbal fermentation – stopped altogether. The new role model was the communist resistance fighter. That's a mistake because whenever I want to understand an epoch in the history, I should know both the good things as well as the bad things. My book isn't meant to denounce the Škoda workers in general. Mass recreations were enjoyed not just by the Škoda workers but those from the whole Protectorate. So what has made Pilsen exceptional? I built on the fact that Škoda Works was en elite company. Workers in the arms industry, which were considered a phenomenon, were counted in thousands right here. We tend to imagine that we "only" had the resistance here and lots of people were executed. But if we are seriously discussing the quality of life, we need to say that the soccer league had a huge number of visitors, and so did the theaters, in 1941 Pilsen premiered 62 plays in the theaters, and over 100 million people in the whole Protectorate came to cinemas in 1944. When Warsaw went through the uprising when the Poles were being eradicated and the city was razed, Pilsen lived in a paradise. People were surrounding the ponds of Bolevec, bathing and swimming, and they had fun with jazz. If the same events took place today, most people will behave in the same way, don't you think? They would, there's no argument about it. At that time, in the midst of a cruel war, people could live a more or less normal life. But of course, if someone resisted, they executed him without mercy. We should admit what the conditions have been like. We shouldn't compare the time with our prosperous life during the interwar republic, but with the life in other countries during the same wartime. How did the Yugoslav, Russian, Ukrainian, Polish, or English people lived at that time. All of their lives sucked in comparison – Czechs enjoyed the paradise in comparison. After the war, it became fashionable to paint ourselves as the victims, to say how we were grilled by the German and how much suffering there has been. But wasn't it a certain dark age? Don't forget that for our generation in mind, the ideologists have painted a picture of a land where everything that was Czech was forbidden and people could have been executed for any silly reason. But that wasn't quite the case. We didn't have the Czech statehood but the Czechness wasn't quite suppressed. In newspapers and magazines, we may read about the celebrations of the greatest Czech classics – (composers) Dvořák, Smetana, (writers) Neruda, Němcová, and others. Yes, we have a huge trauma from the destroyed villages of Lidice and Ležáky but we certainly haven't undergone the terror that was familiar to the Poles or Russians. Even in Pilsen, people were being executed and the stories are chilling. But on top of that, people were going to jazz, swing, to circuses, and taverns and swimming pools were full of people who enjoyed themselves. Of course, everyone wants to survive. But the perspective on the Nazi occupation period in Pilsen is simply an opportunity to see the insanity and incredible contrasts that the era was providing the people with. Also, we should say what is the people's intrinsic nature – even today, lots of people would be just fine with a dictatorship. They wouldn't be interested – they would be effectively saying Our lives are good, so why should we care? Is it an attitude that dictatorships may rely upon? It's interesting that both regimes fell in love with the workers. It's one of the greatest shocks to see the equivalence of the manipulation and the exploitation of the celebrations of the human work and of workers by the official propaganda – during the communism and the Nazism – which is obvious to someone who has read the newspapers and other documents from those epochs. Our generation has grown up while being massaged by this stuff during socialism and as a result, I wasn't able to believe that the photographs with the same slogans were taken in 1943. I told myself: That's not possible, this must be the 1950s. Take the workers' holidays – previously, people typically went to the countryside and worked on their little fields and gardens. And the people suddenly got a stay in the most luxurious hotel Alexandria or Palace in Luhačovice, a spa town. Such an experience may change a person, the people were bought. When the war was over, no one remembered those benefits. Especially after 1948, lots of people were declaring themselves to be wartime resistance fighters. It's one giant fraud. And the recreations started to do their trick again. The flip side of these advantages of Pilsen thanks to Škoda were the consequences of the bombardment, weren't they? We have to respond with one fact here – in France, on the D Day and soon afterwards, 30,000 civilians died when the Allies were bombing the battlefront. Here, nothing of that type has ever taken place. I don't want to downplay the casualties and human tragedies that the bombardment of Pilsen has caused. But in comparison with England and France, those events were minimal. On their voyage through Europe, tens of thousands of U.S. troops have died, too. And we have to realize that Škoda was a functional armory which was emitting kilotons of ammunition and technology for the military up to the very final moments. What was it actually producing? Throughout the war, it has produced almost 20 million grenades for the artillery, some 18,000 cannons, 20,000 gun barrels for them, and the production kept on rising. The workers had advantages, incentives, and bonuses in the rationing system. The air raids were unpleasant, of course, but in April 1945, no one knew when the war would end. The battlefront with the Americans was still 50 miles away and in the Czech Forest, the whole 7th German Army was lurking. Škoda has already secured a contract for additional hundreds of cannons and it was producing tank destroyers which is a good product as an example: in January and February 1945, it produced about 100-120 tank destroyers per month. In March, it was already 178. You're writing about the R.A. Dvorský's orchestra that was still playing for the Škoda workers during the 97th the so-called diverse, motley evening organized by the Germans and attended by hundreds of people – on April 17th, 1945. Czechs were enjoying themselves but at the same time, they were looking forward to the liberation by the Allies in a few weeks. Everything was working fine here up to the very final moments. The book is trying to paint the ordinary life – the trolley buses were introduced in 1941, the children's infection pavilion of the hospital was open, and so was the maternity hospital. Some of these things had already been prepared before the war but the Nazis didn't stop them. Germans themselves were facing huge problems in their Vaterland, with consequences of the air raids, with blackouts and broken water pipelines, and so on. People are often surprised: Did Czechs play a soccer league? All of them should have been terrified and hidden in their apartments or basements. Were they visiting carnivals and amusement parks? Was jazz being played? In fact, Škoda Works had a jazz orchestra and they built a symphonic orchestra on top of that. It sounds unbelievable. There was a certain "normalcy" here even though a human could see his neck cut on the following morning. He could have been executed or jailed just for listening the radio from London. This is a really powerful mixture of sentiments. What conclusions do you make out of all of this? For more than 5 months, I was reading the newspapers from the Protectorate era. A day after day, various rumors, articles about the weekend, how they lived, where they went for a trip, how they flooded a circus when it came. When Viktoria Pilsen was playing (soccer) against Sparta Prague, almost 20,000 people were roaring at the playground (now, even after the upgrade, the new-and-five-times champions Viktoria's stadium's capacity is only 11,000). After that reading, one realizes that as time goes by, the epochs replace others, the regimes and governments are alternating, but the people are still the same. The warning for the present time says that we may easily find ourselves in a similar situation – someone [LM: the EU is most likely now] may manipulate with us again, but lots of people will be willing to adapt and live their own problems. That's why I think that we need to be reminded of such things. People may lose an illusion about bravery, heroism, and irreconcilable hatred, but the life proceeds differently. A country surely wants to have a history that is full of heroes but the actual history is different. In this year, we celebrate the 100th anniversary of Czechoslovakia and I expect us to do more than just pat each other on the backs. 1. Production of Jagdpanzers 38 and tank destroyers Hetzer kept on increasing in Škoda. In March 1945, the record number of 178 in March 1945 left the factory. 3. During the air raid on May 14th, 1943, a bomb destroyed a building in the housing colony for Germans, nicknamed the Little Berlin by the Pilsner Czechs. A pressure wave broke windows and blew roofing tiles away. 4. The well-known star-like Pilsen's prison (Bory) was covered by masking nets. This trick was introduced by the Germans after the first British air raids. 5. 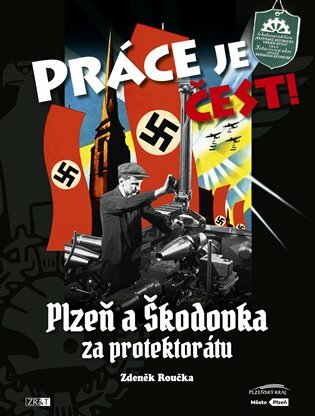 Because Škoda was at risk from air raids, a huge wooden replica of the whole factory was built from wood in 1942-43, between Vochov and Vejprnice, villages that were a mile West from Pilsen (and also a mile from the Protectorate border with Germany proper i.e. with the Sudetenland). 6. Christmas event for the Škoda's employees' kids. December 23rd, 1944, refreshment and gifts were awaiting the kids in the main corporate dining hall. 7. People are leaving one of the big shelters in Skvrňany (a Western suburb of Pilsen), near the Brantl Slope, after an air raid. 8. In January 1942, three transports left the Falcon Gym (Sokolovna) full of Jews going to the concentration camps. Only 204 out of 2,604 people returned after the war. 9. Sd.Kfz11 trailer trucks for cannons in front of the Vehicles building in Škoda, ready to be sent to the Eastern Front. 10. In December 1944, a bomb explosion and a pressure wave devastated the round final stop and trolley buses near the (currently naturally devastated) Municipal Spa And Watering Resort after an Allies' air raid. 11. Near the Vehicles entry to Škoda, on April 24th, 1941, the first concert for the workers for their great work for the Reich. A new workers' brass orchestra played for them. 12. Ammunition for artillery was a priority in Škoda, 31 types of grenades were produced according to the original design made in Škoda. 13. 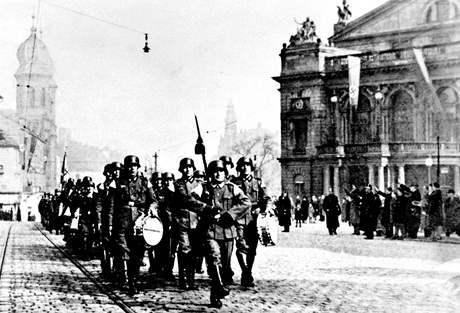 On the main Square of the Republic, June 26th, 1940, a military parade celebrated the Wehrmacht's victory in France. 14. Wehrmacht soldiers with quilts in their armpits are occupying the famous 35th Regiment Barracks in Pilsen. 15. Škoda was ruined after the April 25th, 1945 air raid. Tank destroyers Hetzer on the picture haven't been completed yet. 16. The Allan Sisters were swing superstars that have also played for the Škoda workers. 17. Jaroslav Weidmann from the Defense of the Nation, one of the 18 people executed in the Vejprnice Gorge during the 1942 Heydrichiad Terror. P.S. : While I think that all the comments above are true and important, I wouldn't agree with some corollaries that someone may want to write in between the lines, e.g. with the suggestion that Czechs are equally (or almost equally) responsible for the atrocities in the Nazi era as the Germans. Not at all. This happy adaptation is surely a testimony of mainstream Czechs' spinelessness (or flexibility, if you formulate it more neutrally) – but that's a different vice than the truly active cruelty.